No other candidate came close to raising as much money as Mayor Miro Weinberger leading up to the March 3 election. Still, several Burlington City Council candidates raked in large amounts of money for their races. Candidates and parties submitted their campaign finance disclosure reports with the Vermont Secretary of State Tuesday. The highest roller — incumbent Democrat Weinberger — brought in $109,172 and handily won the mayor's race with nearly 70 percent of the vote. Despite being in a less-competitive race, the mayor matched the fundraising prowess he exhibited during his first campaign in 2012. Recent contributors include restaurateur and Green Mountain Care Board chair Al Gobeille ($500) and his wife, Kim Gobeille ($500); Paul Lekstutis, a consultant in renewable energy ($1,000); and Charlotte Ancel, general counsel for Green Mountain Power ($500). The mayor has spent $95,484. Weinberger's challengers trailed him on fundraising from start to finish. Progressive Steve Goodkind, who got 22 percent of the vote, took in $10,870 and spent $11,120. Independent Greg Guma (6.6 percent of the vote) collected $14,540 and Libertarian Loyal Ploof (2 percent) raised $530, $500 of which came from the Vermont Libertarian Party. In the Ward 3 city council race, Democrat Sarah McCall drew $8,756 in an unsuccessful race against Progressive Sara Giannoni, who raised only $3,063. Both were first-time candidates. Running in the North District, Dave Hartnett, who lost the Democrats’ endorsement, proved perfectly capable of drumming up cash without the party's backing. The incumbent councilor raised $5,955, including several large donations from prominent real estate figures — Bill and Phyllis Bissonette each gave $1,000, and Ernest Pomerleau donated $200. Harnett spent $6,302, beating Democrat Carmen George's $3,904 outlay. 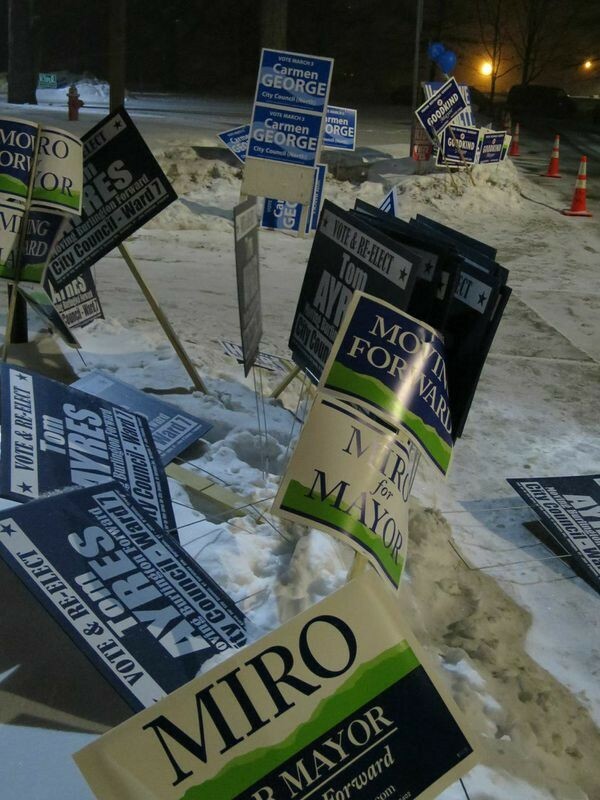 It's unclear how much the Vermont Democratic Party contributed to Queen City races. Its Burlington headquarters were humming during election season with both college student volunteers and party staffers pitching in. The campaign finance report shows that the party drew in $20,641 during this election cycle and spent $44,255. But a large portion of the spending was actually money transferred to its federal fund, according to the VDP's compliance officer. The state party's spokesperson, Ben Sarle, declined detail the level of support and number of staffers working on the local elections. "I’m not going to go into the weeds on that one," Sarle said. "As a party we helped out because that's what we do." Another item that remains unknown: who paid for opposition research on Democratic Ward 7 Councilor Tom Ayres. Ayres' opponent, Republican Michael Ly, said he knew nothing about it. Senning said that if an individual is doing direct spending — rather than contributing to a candidate — they aren't required to report it.